Sourav Ganguly's Pune Warriors may have lost four matches in a row but they would find themselves at 'home' as loyalties will be split when they face Kolkata Knight Riders in an emotionally-charged up IPL contest in Kolkata on Saturday. The stakes for the match are high with die-hard Ganguly fans rooting for the contest as a revenge for city's icon after being snubbed by his former franchise following a bitter association for the first three seasons. From celebrities and experts to commoners, everybody is eagerly waiting to see the former India skipper lead the side from the visitor's dressing room at the Eden Gardens, a venue where he grew up as a cricketer. But going by the form book, all is not well for Ganguly's soldiers, while the Knight Riders are on the right track to seal the last-four berth, placed comfortably in the second spot of the IPL ladder. Having lost six of their last seven games with their latest defeat on Thursday to Mumbai Indians, Ganguly and Co are languishing ahead of bottom-placed Deccan Chargers. But the match at Ganguly's home, aided by the partisan crowd, could give Pune the perfect opportunity to make a comeback. Their defeat by the narrowest of margin -- one run -- at their backyard on has compounded Ganguly's misery. Chasing a mere 121, Ganguly's slow innings meant that Pune slowly made the task difficult even as a well-played Mithun Manhas remained unbeaten at the other end with a doughty 42. 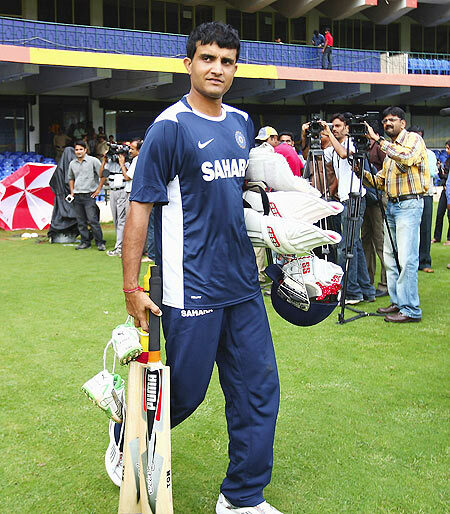 Ganguly looked woefully out of sorts in his 12 from 22 balls, unable to earn anything more than the difficult singles. He showed glimpses of old when he lifted Lasith Malinga up for a boundary but only to be bowled in the same over for a 24-ball 16 with the asking rate climbing to nine. But with the never-say-die attitude of the retired India skipper, it remains to be seen how he brings himself out of the rut or think of gracefully leaving the stage with a more capable Aussie skipper Michael Clarke waiting in the wings. Even against Deccan Chargers, a tactical blunder of bringing himself to bowl at the death after leaking 15 runs from his first two overs cost them the match. It's time he rethinks his strategy or rejig his line-up, bringing world-class Bangladeshi batsman Tamim Iqbal in place of Jesse Ryder. Tamim came to the IPL with four consecutive half-centuries in the Asia Cup -- one of them against India -- but was still left out and with the tournament already past the halfway stage, it remains to be seen how the think tank keeps him to warm the bench ahead of a must win matches. With Ashok Dinda back, in their last match, after recovering from a side strain, bowling should not be of much concern. In sharp contrast is the home camp which is on a four-match winning run with skipper Gautam Gambhir, leading the side by example. Gambhir has shown maturity in batting as well as his captaincy. His gesture of handing over his Man-of-the-Match award to a young Debabrata Das in their last match has earned him a lot of accolades. With 16 needed off 12 chasing 140 in Chennai, the fall of Gambhir after an entertaining 63 had caused a scare following yet another failure of Yusuf Patan. But Das showed nerves of steel playing the role of a finisher with a four-ball 11 that included two match-winning boundaries. He may have been removed from Team India vice-captaincy, but Gambhir has been in scintillating form leading the Knight Riders to a comfort zone in their pursuit of a play-off berth. The left-hander is easily the Knight Riders' best batsman so far, with 365 runs at 143.70 strike rate in a star-studded batting line-up that is yet to fire though. The likes of Yusuf, with a terrible average of 6.85 at 96.00 strike rate, Jacques Kallis (22.87 at 100.00), Manoj Tiwary (24.83 at 104.92) and Brendon McCullum (13.50 at 97.59) have been dark spots in a side that performed well as a bowling and fielding unit. The spin pair of Iqbal Abdulla and Sunil Narine, together with Rajat Bhatia's slow medium and Brett Lee's sheer pace has done wonders on the tailor-made difficult Eden track. With the dangerous batting line-up they boast of, the Knight Riders have emerged as one of the strong contenders to win the trophy this time. But rain could play spoilsport in the much-anticipated clash. It had been the case here on two previous occasions and the Met forecast been no different this time. Kolkata Knight Riders: Gautam Gambhir (c), Brendon McCullum (wk), Jacques Kallis, Manoj Tiwary, Yusuf Pathan, Debabrata Das, Laxmi Ratan Shukla, Rajat Bhatia, Sunil Narine, Brett Lee, Iqbal Abdulla, Chirag Jani, Iresh Saxena, Jaidev Unadkat, Manvinder Bisla, Pradeep Sangwan, Sanju Samson, Sarabjit Singh Ladda, Mohammad Shami Ahmed, Eoin Morgan, Marchant de Lange, Ryan ten Doeschate and Shakib Al Hasan. Pune Warriors India: Sourav Ganguly (c), Jesse Ryder, Robin Uthappa (wk), Michael Clarke, Steven Smith, Mithun Manhas, Wayne Parnell, Bhuvneshwar Kumar, Murali Kartik, Ashish Nehra, Ashok Dinda, Ali Murtaza, Anustup Majumdar, Dheeraj Jadhav, Eklavya Dwivedi, Harpreet Singh, Harshad Khadiwale, Kamran Khan, Krishnakant Upadhyay, Mahesh Rawat, Manish Pandey, Mohnish Mishra, Raiphi Gomez, Rahul Sharma, Sachin Rana, Shrikant Wagh, Alfonso Thomas, Angelo Mathews, Callum Ferguson, Luke Wright and Marlon Samuels. Match Starts 4 pm IST.